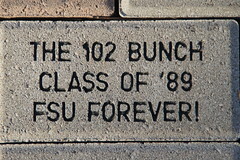 Scholarship Walkway is located in 5 sections near Williams Center. This map outlines one such section, with the link below indicating the section (A-E) and location number of each brick. Section A is closest to the Williams Center cafe entrance. Click below for a full listing of installed bricks, and their corresponding locations.